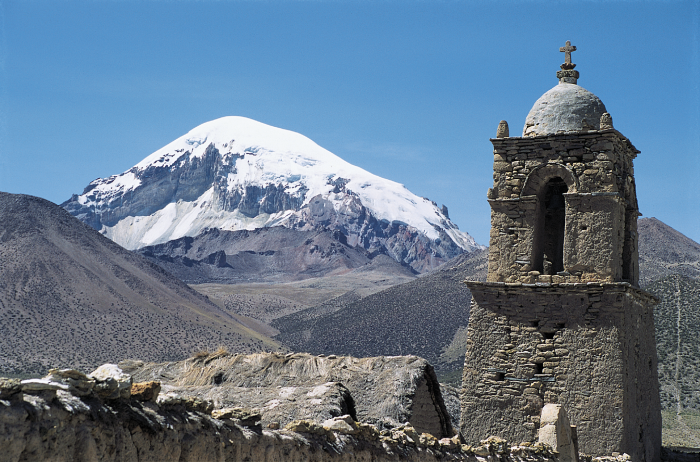 Framed by a church built c. 1886, Nevado Sajama (21,464 ft above sea level) rises behind the village of Sajama in western Bolivia. Ice cores taken from the summit detail global-scale changes in climate. Ice cores recently recovered from high-elevation sites within the Tropics are providing long, detailed records of past climate. These histories contain information about global-scale changes in climate as well as environmental changes in areas where most human activities occur. Climatic information is reconstructed from ice cores by analysis of geochemical measurements made sequentially down-core, including oxygen isotopic ratios, chemistry, and the concentration of dust. Two ice cores were drilled to bedrock (each 435 ft) in July 1997 at the summit of an ice cap in the Andes of Bolivia, by Dr. Lonnie Thompson, The Ohio State University, and his team. Climatologists from the University of Massachusetts (UMass) are collaborating with these scientists to document the ice cap climate, and to better understand the atmospheric sources of geochemical variability in snow accumulating at the site. In support of the ice core calibration, weather stations are operating near the drill site on Sajama (21,464 ft.; 18°06’S and 68°53’W), the highest peak in Bolivia, and on Nevado Illimani (20,555 ft.; 16°39’S and 67°47’W), which is 200 km essentially upwind of Sajama. Both stations measure snow accumulation and ablation hourly, along with snow temperature and a variety of meteorological variables. Analysis of these data is closely tied to the results of annual snowpack studies carried out in the vicinity of the stations, and with data from NCEP global analyses (National Centers for Environmental Protection of NOAA). The design of these stations required balancing competing goals. For example, global solar irradiance can exceed 1100 W m-2 at mid-day, requiring mechanical aspiration of the temperature and humidity sensors. While abundant radiation could easily provide continuous power to the fans, we limited the system design to two 10W solar panels to reduce wind loading. Consequently, the fans are operated for only one minute out of every ten. Both stations are designed around CR10X dataloggers. Data are stored on-site in the dataloggers and on SM716 storage modules, and both sites use GOES telemetry to deliver data in near-real time to UMass. The Sajama station maximizes CR10X capacity, with duplicates of most sensors and an AM416 multiplexer for thermistors and thermocouples. Installing and servicing the stations has been an adventure – it is no mystery to us why so few weather stations operate at high altitudes. Upon arrival at the summits, one’s first inclination is not to dig down six feet through wind-packed snow in search of the enclosures. Several nights are spent at the summit on each visit, often in winds so strong that flapping tents preclude conversation. Prior to departure, a call to UMass by satellite phone provided a reassuring check on satellite telemetry. The performance of the stations has been quite remarkable. To date after 26 months, the Sajama record for most variables is 100 percent complete. This is in spite of unusually heavy accumulation (13 ft.) during the 1996-97 wet season. Data from the stations now encompasses one of the most significant El Niño events of the century, and are providing valuable insight into the record of tropical ice cores. Further details on the stations, and first-year results, are available in the September 1998 issue of the American Meteorological Society Bulletin, and from our website at www.geo.umass.edu/climate/bolivia.html. We would like to acknowledge the financial support of NOAA, logistical help from Carlos Escobar, and the devotion of Campbell engineers. Read this case study to learn how high-altitude weather stations support research on climate change and ice cores.